This day, devoted to Writing, was run by Dianne Excell. Dianne is an EAL and Literacy Consultant with many years of experience teaching in Bradford. She has been a member of NALDIC’s Executive Council for 8 years. She has written articles for NALDIC Quarterly and has been advising Pearson on how to support teachers and students in developing language and literacy strategies whilst teaching content and academic language at the same time. Her sessions at the course were on Developing Writing. The session’s aims were to consider what demands there are on EAL and advanced bilingual learners in terms of writing at word, sentence and whole text level. The sessions included a lot of different examples of activities for students and ways of assessing progress in writing. She began by referring to The National Curriculum in England Framework from July 2013. The document, very disappointingly, devotes only two paragraphs and 94 words to what teachers should do for EAL learners. Paragraph 4.5 states that teachers must take into account the needs of EAL learners and that monitoring their progress should take into consideration their age, time they have spent in the UK, ability in other language and previous educational experience. Paragraph 4.6 also states that EAL learners’ ability to take part in the curriculum might be better than their communicative skills in English and, thus, teachers should plan for these pupils’ development of English and support pupils in accessing the curriculum. Whilst all true, this is not exactly a massive amount of text – particularly if you take into account the number of EAL students in the country, and the intricacies of bilingualism, and how English as a second language is developed. Surely we can do better than 2 paragraphs and 94 words for over 1 million EAL students in the country (and growing)? Following this, Dianne made a reference to Marion Sharief’s Distinguishing the difference: SEN or EAL? An Effective Step-by-step procedure for identifying the learning needs of EAL pupils causing concern (link here to where you can get this lent to you). This is a brilliant document written following research done by BASS in Birmingham, which shows visually what kind of progress EAL students arriving at a certain age (into a particular school year) can make, comparing it with national NC averages. It would be very useful to show this to teachers at your school at a training session – it visibly shows the massive amount development that is ahead of EAL learners as opposed to an average native English speaking child. The matrices make a specific distinction between the time required to reach CALP for children with EAL and the way they could develop CALP faster with appropriate support. So, for instance, if a child arrives from abroad in the middle of y7 and is on L1 Threshold (QCA EAL extended scale levels), we can expect that it would take 7 years for him/her to develop CALP: meaning that CALP would develop too late for their GCSEs! However, with appropriate support, Sharief suggests it might take 5 years to get to CALPS (understood as NC level 5A and above). You might also be interested (this is from my own research) that the Havering EAL Team has written its own guidance, based on the BASS research, called Measuring the progress of learners of EAL: A system for analysing whether or not pupils are making satisfactory progress, which presents the same information in neat and simple tables. There are separate tables / pages for students arriving in different years, i.e. a different page year 1, 2, 3… until year 9. BASS’s document also makes a note the time needed to reach CALP will vary for children with prior L1 schooling and those who hadn’t received such schooling. The Havering team document states that where an EAL child does not make the progress it specifies in its tables, this can mean one of the two following things: (1) the support is inappropriate and/or doesn’t work, (2) the child might have special educational needs. In Dianne’s own research (conducted in 2003 for her Bilingualism in Education Certificate via Birmingham University), the learning continuum (2003, in Dianne’s presentation – I haven’t been able to figure out the specific title of his research) is a distinction between skills required higher order academic language (e.g. 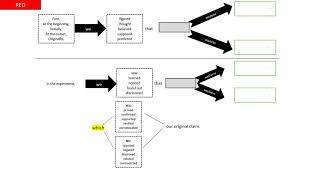 arguing a case, justifying opinions, analysing, predicting) – and non-academic language. She analysed the percentage of possible writing tasks marks attained by high- and low-achievers: his graph showed the continuum as a gap between high and low achievers. Dianne stated here that all assessments require students to read information and questions and them express themselves in writing; this is even when the subject is practical. A lot of students will not have a problem with the subject-matter, but they will struggle with being able to express their thoughts in English – in writing – and that’s where they might need help. develop learners’ independence by using scaffolding and modelling and then slowly withdrawing these as your learners progress. At this point, we (various course participants) considered our experience with writing – thinking about what we wrote that week and what kind of writing we did. We quickly noticed that our writing had much to do with writing notes and writing mobile phone texts and emails. Very different from the demands of schools, which ask our students to write essays (handwritten) and perform structured handwriting. Some of the course’s participants linked this to the importance of students having quality pen and paper to actually be able to write properly and to the importance of us teaching good handwriting. The importance of digital technology and its impact on English has been researched by David Crystal. Why not read his Txtng: The Gr8 Db8. Writing abilities need to be developed, she says, at word level, sentences level and whole text level. Yet again, Norah McWilliams’s What’s in a word? was referred to at this stage. It truly is a genius and wonderful book! What followed now was a fantastically massive amount of practical activities – both for us to do on the day and examples that Dianne provided. Word Study – the idea here is that you think of an objective to cover this week for literacy or numeracy and then decide on the kind of vocabulary that will go with this topic; then decide on a new or difficult word to focus on. You put that word in the middle of a sheet and surround it with questions / tasks, e.g. Picture, Definition, Sentence, Synonyms. Vocabulary Cline – it is essentially a triangle / ramp going up as the words are going up in strength/are graded. It is somewhat similar to Yvonne’s Graded Adjectives from my previous post. Please see the image below, adapted from Dianne’s materials. Obviously, these could be used for different types of words, not just adverbs of frequency, for instance for adjectives – Dianne provided another example: words going from “minute” to “gigantic” and suggested this can be used for verbs as well, e.g. starting with “walk” and speeding up towards “saunter”, “trot”, etc. Collocations – here, we got a diagram where children are supposed to choose one word from a column and one from a row (akin to coordinates) to create meaningful word collocations. Structuring expanding vocabulary – Dianne said that we can provide our students with semantic and topic sets of words, and draw their attention to the meaning (semantic) relationships between words: synonyms, antonyms, hyponyms (these are words that specific examples of a broader category of words, e.g. a computer is a hyponym for a device) and converseness, e.g. mother-daughter, teacher-pupil. Looking at syntax and grammar – Dianne reminded us that should be looking with our students at word order, pronouns, tenses, subject-verb agreement, prepositions, determiners, plurals, word order and punctuation. Examine writing samples – here, we examined texts from a few new arrivals and were asked to find three aspects of their writing that the children knew and three aspects that needed to be developed. Obviously, these three (latter) aspects would work as a writing target for the children. She referred to CPDM2 Analysing Writing and CPDM3 Making sense of literacy targets here. 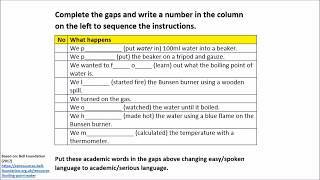 Gap filling – the name of the activity leaves no doubt what it is about: these could be with pictures or words in a box below, but all involve completing a text / sentences with words or phrases. 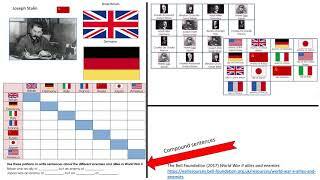 Sentence beginnings and endings – in this activity, students choose from two columns and create full sentences. Sentences beginnings, middles and endings – as above, but in this case, students choose from three columns. True and false – this is about ticking true sentences and correcting the false ones. Parallel writing – here, a teacher could first scaffold and model sentences, e.g. Priyanca lives in London. She is Indian. She is dreaming of becoming a doctor. More advanced bilingual learners – here, in groups of four, each of the learners gets a different word (e.g. noun, adjective, adverb, verb). They have to, together, write a sentence using these words. We did this at the course on the day with Dianne, but EAL students would have to consciously think of the word order, subject-verb agreement, punctuation, any prepositions required, tenses, etc. – in other words, their language learning would be made explicit. Talking to writing – Dianne referred to the Talk to Writing Mode Continuum as described by Gibbons in her fantastic book English Learners, Academic Literacy and Thinking (2009). She stresses the need to teach our students how language changes: the less shared knowledge between speakers/listeners, the more the need for the language to become explicit – or, in other words, the less speakers are doing things together, the less they can take for granted and that’s why, for instance in purely academic texts, the language has to be so explicit. We need to teach this to our children – make them aware of the need of making changes to the language. Dianne quoted some of Gibbons’s examples of this: the face-to-face language of children as they do a science experiment is very different to the kind of language used if one of them has to retell the procedures of the same experiment to another group who did not participate in the original experiment (oral retelling). The language becomes even more academic if one of the children is asked to do a written summary about this experiment – now, the audience intended is not seen anymore. Finally, there is an academic text type of writing, which is written about the subject matter with no reference to any people/audience. This is on the most academic end of the spectrum here. It is also good to remember, which is what Dianne talked about, that the less academic text is informal and is mostly speaking-like (e.g. playground talk) and the most academic texts are more writing-like. For instance, Dianne provided us with the following examples (moving from informal to formal): playground talk – speaking to the boss – presenting feedback to peers – reading the news – giving a lecture. (Dianne suggested becoming familiar with CPDM 5 Ensuring the attainment of more advanced learners of EAL: Bridging talk to text here. Dictogloss – a teacher reads out a piece of text (Gibbons suggests it’s done 3 times) and students reconstruct the text eventually in groups by pulling their notes together. Language, genre, field, tenor and mode – we need to remember about these aspects when teaching writing to our students: Language (consider Halliday’s Introduction to Functional Grammar, in which Halliday focuses on how grammar is used without considering it arbitrary), Genre (including register, discourse elements), Field (everyday commonsense, specialised and abstract and technical language), Tenor (from informal/novice through increasing formality to formal and objective language) and Mode (which can be spoken with shared context, spoken texts written down or written texts spoken aloud to written texts with context not shared). Describe genre, formality of the text, paragraphs. Review – set new targets and teach the areas that have been seen as areas of difficulty. Dianne summed up this brilliantly strategies-specific session by saying that teachers who explicitly teach language within their lessons lead to their students’ (all of them) higher attainment levels and improve the quality of their writing. She also suggests (and so do I!) that you get Gordon Ward’s Racing to English set of materials for EAL learners. It’s a brilliant set of resources! Crown (2009) CPDM 2 – Analysing writing: assessing the needs of more advanced learners. In Ensuring the attainment of more advanced learners of English as an additional language (EAL). Available at: <http://www.google.co.uk/url?sa=t&rct=j&q=&esrc=s&source=web&cd=1&cad=rja&uact=8&ved=0CCAQFjAA&url=http%3A%2F%2Fwww.naldic.org.uk%2FResources%2FNALDIC%2FTeaching%2520and%2520Learning%2FCPDM2.pdf&ei=H_rxU522GMrQ7AbutYHgCA&usg=AFQjCNEPZY_wFPAvThQ6YYWXS8wrGJhYvQ&sig2=84tJmJQTs_Lxq14uzBG9bA> [Accessed 19 August 2014]. In: NALDIC (2014) NALDIC-Bell EAL Summer School 2014. Crown (2009) CPDM 3 – Making sense of literacy targets: learning objectives and activities. In Ensuring the attainment of more advanced learners of English as an additional language (EAL). Available at: <http://www.google.co.uk/url?sa=t&rct=j&q=&esrc=s&source=web&cd=1&cad=rja&uact=8&ved=0CCAQFjAA&url=http%3A%2F%2Fwww.naldic.org.uk%2FResources%2FNALDIC%2FTeaching%2520and%2520Learning%2FCPDM3.pdf&ei=9vrxU_OSEu6O7Qa93YDACQ&usg=AFQjCNHaFJ_ilksEessjbsT_bnANGeiaUQ&sig2=f_HORB_EyqIJAVWNCSjFbw> [Accessed 19 August 2014]. In: NALDIC (2014) NALDIC-Bell EAL Summer School 2014. Crown (2009a) CPDM 5 Bridging talk and text: formal talk. In Ensuring the attainment of more advanced learners of English as an additional language (EAL). Available at: <http://www.google.co.uk/url?sa=t&rct=j&q=&esrc=s&source=web&cd=1&cad=rja&uact=8&ved=0CCAQFjAA&url=http%3A%2F%2Fwww.naldic.org.uk%2FResources%2FNALDIC%2FTeaching%2520and%2520Learning%2FCPDM5.pdf&ei=FAHyU5n4PLH07Abe9YDICQ&usg=AFQjCNFfNHn7QcaVwDeUF7ctkMp1Boz2eQ&sig2=7rePnxV_LPKgUYLG8IYCcw> [Accessed 19 August 2014]. In: NALDIC (2014) NALDIC-Bell EAL Summer School 2014. Crown (2009b) CPDM 8 Thinking and writing as a writer: the sequence for teaching writing. In Ensuring the attainment of more advanced learners of English as an additional language (EAL) Available at: <http://www.google.co.uk/url?sa=t&rct=j&q=&esrc=s&source=web&cd=4&cad=rja&uact=8&ved=0CDgQFjAD&url=http%3A%2F%2Fwww.naldic.org.uk%2FResources%2FNALDIC%2FTeaching%2520and%2520Learning%2FCPDM8.pdf&ei=FAHyU5n4PLH07Abe9YDICQ&usg=AFQjCNEJcAxHIdWRP6qKaXLTIof7zNrYXA&sig2=w1plOh8k0aiJwFgLDT1nLg> [Accessed 19 August 2014]. In: NALDIC (2014) NALDIC-Bell EAL Summer School 2014. Department for Education (2013) The National Curriculum in England Framework from July 2013. Available at: <https://www.gov.uk/government/publications/national-curriculum-in-england-framework-for-key-stages-1-to-4/the-national-curriculum-in-england-framework-for-key-stages-1-to-4> [Accessed 19 August 2014]. In: NALDIC (2014) NALDIC-Bell EAL Summer School 2014. Cameron, L. (2003) Writing in English as an additional language at Key Stage 4 and post-16 edited by OFSTED. Available at: <http://www.google.co.uk/url?sa=t&rct=j&q=&esrc=s&source=web&cd=2&cad=rja&uact=8&ved=0CCsQFjAB&url=http%3A%2F%2Fwww.naldic.org.uk%2FResources%2FNALDIC%2FTeaching%2520and%2520Learning%2FWriting%2520in%2520English%2520as%2520an%2520additional%2520language%2520at%2520Key%2520Stage%25204%2520and%2520post-16%2520(PDF%2520format).pdf&ei=Q8_xU5WjLuuI7Aa3q4DgAw&usg=AFQjCNFOe55UxdYCigOK_2Agr7-clIn9nA&sig2=gODK5_RpUH_1TAeLe3rj8w> [Accessed 19 August 2014]. In: NALDIC (2014) NALDIC-Bell EAL Summer School 2014. Crystal, D. (2008) Txtng : the Gr8 Db8. Oxford: Oxford University Press. Gibbons, P. (2009) English Learners, Academic Literacy, and Thinking: Learning in the Challenge Zone: Greenwood Publishing. In: NALDIC (2014) NALDIC-Bell EAL Summer School 2014. Halliday, M. A. K. and Christian M. I. M. (2013) Halliday’s introduction to functional grammar. Fourth edition. In: NALDIC (2014) NALDIC-Bell EAL Summer School 2014. McWilliam, Norah. 1998. What’s in a Word? : Vocabulary Development in Multilingual Classrooms: Trentham Books: Stoke-on-Trent. In: NALDIC (2014) NALDIC-Bell EAL Summer School 2014. Palmer, S. (2001) The Discussion Book. TTS. In: NALDIC (2014) NALDIC-Bell EAL Summer School 2014. Palmer, S. The Recount Book. TTS. In: NALDIC (2014) NALDIC-Bell EAL Summer School 2014. Palmer, S. The Persuasion Book. TTS. In: NALDIC (2014) NALDIC-Bell EAL Summer School 2014. Rosamond, S. (2003) Distinguishing the difference SEN or EAL? : an effective step-by-step procedure for identifying the learning needs of EAL pupils causing concern. 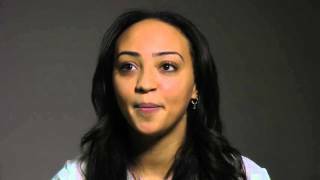 Birmingham: Birmingham Advisory and Support Service. In: NALDIC (2014) NALDIC-Bell EAL Summer School 2014. Havering EAL Team. (2006) Measuring the progress of learners of EAL: A system for analysing whether or not pupils are making satisfactory progress. Available at: <The London Borough of Havering. Available at: <http://www.google.co.uk/url?sa=t&rct=j&q=&esrc=s&source=web&cd=1&cad=rja&uact=8&ved=0CCIQFjAA&url=http%3A%2F%2Fwww.tgfl.org.uk%2Ftgfl%2Fcustom%2Ffiles_uploaded%2Fuploaded_resources%2F3177%2FMeasuring_the_progress_of_learners_of_EAL-guidance.doc&ei=4MjxU_3UDuyI7AbcjYDAAw&usg=AFQjCNGRwTvp1ZktDz0mCyvGElp9FJ9fKw&sig2=zjFgg61LufkRuydzDT38Jw> [Accessed 19 August 2014]. In: NALDIC (2014) NALDIC-Bell EAL Summer School 2014. I teach EAL to Middle & Senior school ss in an International school in India. Although I am a trained Eng. teacher, with a CELTA and years of experience across all ages and levels, this is my first exposure to EAL. Many thanks to this comprehensive account of strategies for Writing, my challenge is to get my EAL ss graduate to CALP from BICS, all of them can speak English to varying degrees of fluency,but display fossilized errors in writing and an inability to stretch themselves.